The FBI data shows that there are approximately 2.2 million burglaries in the US every year. 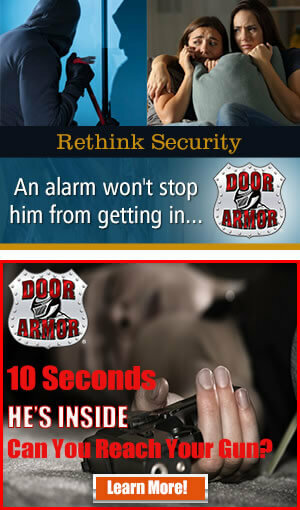 In other words, every 15 seconds a burglary is committed. The data also reveals that most of burglaries are happening in homes. The intruders simply walk right through the front door. Almost all of them occur during the day. The entrance door is the primary point of entry for crooks. Most people do a very bad job of securing their homes. They can take place any time and any day of the week. Burglars are walking down the street, trying to find an easy way to break in. A huge problem is that nine times out of 10 homes are unlocked. That’s unbelievable! According to a former thief, Walter Shaw, who had stolen millions of dollars in goods, getting into homes was always super easy. He points out that every house has a weak spot, even $50 million houses. They all have holes in their security systems. The biggest weak spot is the front door. People often leave them unlocked or they use locks that aren’t strong enough to prevent break-ins. Burglars just walk up and knock to find out if you’re home. Once they are sure you are not home, all they have to do is kick the front door in and they’re in your home. This happens very quickly, in several seconds. The most common area to break when a door is kicked in is the strike plate. There’s a reason for that. The wood isn’t very thick and short screws are used in this area. This means that not very much is holding doors in place. What you should do is replace those very short screws with longer, 3-inch screws. A very cheap fix. A longer 3-inch screws attach to the structure of the building. Now you must destroy the building to enter the house. So, by using the longer screws you can drastically increase the safety of your entry door. Another critical factor is using the right kind of lock. But using just the lock on your door knob is not enough to stop kick-ins. Deadbolt is also necessary. Most folks believe that they are secure with what they have. And some of them don’t even have a dead bolt. They just use the doorknob type of lock. They really aren’t safe as they feel they are. All your entry doors must have grade 1 dead bolts. For additional protection, you should also reinforce your doors with metal plates that go over the jamb, the hinges and the locks. So, you need lots of good locks. You really need to have them to secure your front door. Even if you have a deadbolt on your door, make sure it’s the right kind. You need a grade 1 deadbolt. It’s stronger, it is more expensive but this is really going to help prevent somebody from using a crowbar or kick-in the door. However, the best thing you can do is to reinforce all the weak points on your door. 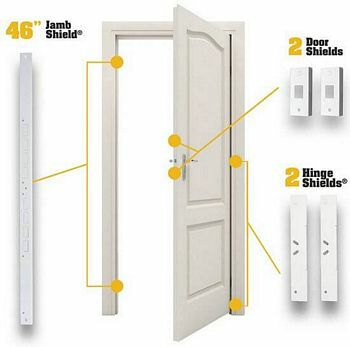 Door Armor kit goes around the lock, it also goes on the door jamb and the hinges. This really prevents somebody from kick-in the door and splitting the door or being able to pry the door open. That metal hardware truly reinforces the door. Forget some old fashioned home safety tips such as asking neighbors to keep an eye on your home. This is the right time to get world’s most effective door security solution and live your life with complete peace of mind.